Dec. 1 issue of Cancer Research. Collaborative efforts by researchers at the Department of Immunology and the Department of Pathology revealed the unexpected potential of tumor-specific Th2 cells for cancer immunotherapy by adoptive cell transfer (ACT) in mice. The study was published in the December 1st 2016 issue of Cancer Research, the flagship journal of the American Association for Cancer Research. 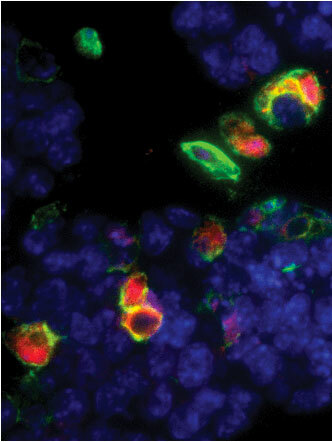 An immunofluorescence microscopy image from the paper was selected to illustrate the journal cover. The journal cover shows that Th2 ACT induced expression of arginase (red) by tumor-infiltrating macrophages (green). Cell nuclei are stained blue. Arginase was shown to be critical for cancer eradication by Th2 cells. Cancer Res. 2016 Dec 1. Home page of Alexandre Corthay's "Tumor Immunology group"